Beach: .7 of a mile to Lambert's Cove Beach. 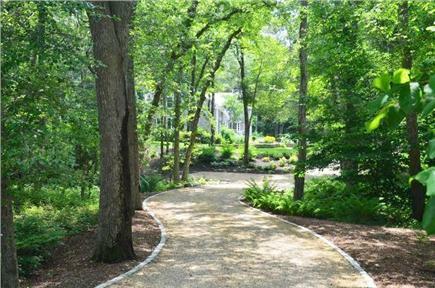 Only .7 of a mile from beautiful Lambert's Cove Beach, nestled on almost four wooded acres, the grounds feature a pleasant brook, hillside and wonderful seclusion. With 4400 square feet of luxury, this property is truly beautiful and many visitors express how special the scenery and interior uniqueness feels. 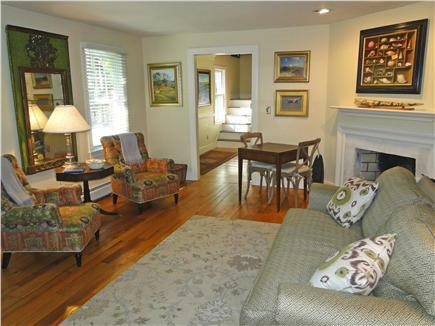 Built in 1985, the home seems much older in terms of the charm of wide pine floors and antique furnishings. Meanwhile, all the modern amenities are evident and provide for a decadent stay. This meticulously maintained home has a large gourmet kitchen with two dishwashers, stainless steel appliances, 2 sinks, granite counters, prep sink, breakfast bar, and a banquet sitting area. With direct access to the patio and many windows facing the wooded lot, you feel nestled in and comfortable. 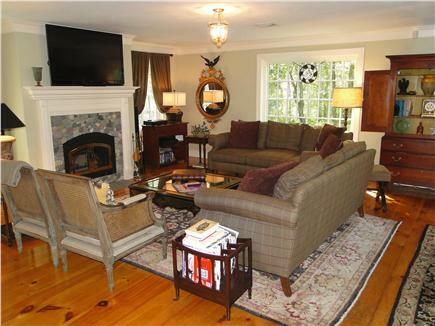 The living room has one of four working fireplaces, a large flat screen HD TV with cable, Blue Ray player and stereo. French doors and large windows make it light and bright. You may choose to dine ''alfresco'' in the adjoining dining room, or if you prefer to quietly read and relax, the library awaits. Enjoy air conditioning in all bedrooms and main living areas: Master Suite, Kitchen and Living room. The master suite upstairs includes a fireplace, spacious closet with a dressing area, along with a luxurious bath with 2 pedestal sinks, a steam shower, and separate Jacuzzi. Enjoy a great nights sleep in the new four poster bed. The house is divided into separate sleeping areas which cater to the extended family or multiple families. Up one staircase you will find the Carnival room with two twin beds and a King bedroom we affectionately refer to as ''Zoe's Suite''. 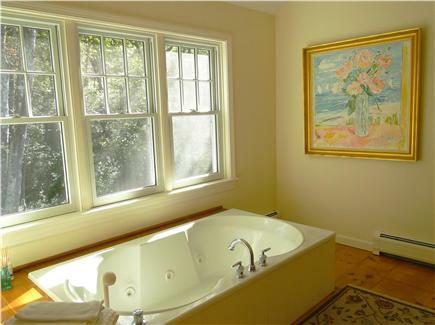 These two bedrooms share a full bath. Downstairs, two bedrooms are located in the back of the house. 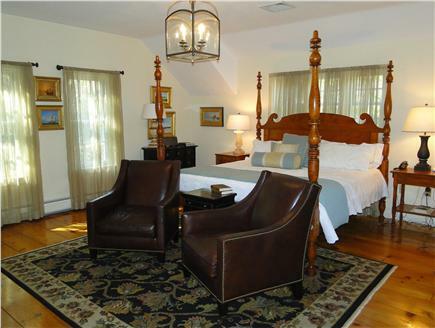 The Charlotte Suite hosts two double beds and the Homestead room sleeps two in a Queen bed. 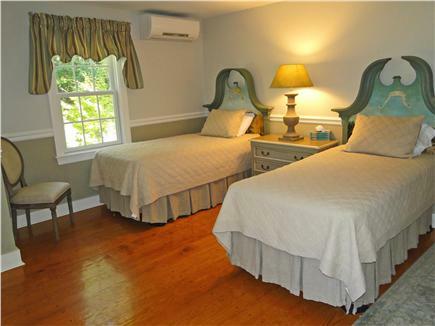 These bedrooms share a full bath and each bedroom has at least one closet area. 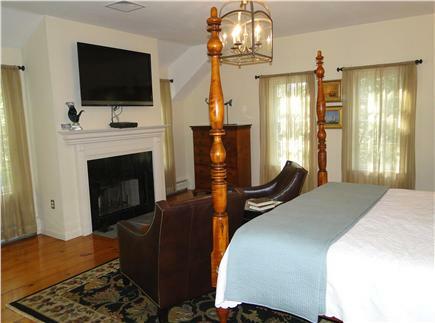 As you can see our home offers all the modern conveniences with a feel of old Martha's Vineyard. The only thing missing is you and your family. Nearest beach: .7 of a mile to Lambert's Cove Beach. Additional availability info: Now booking 2019 season. Book now for best selection . This is a Monday to Monday vacation rental. Additional pricing info: Call for special pricing discounts for multiple weeks/monthly rentals. State and local taxes of 5.7% will apply. Our family’s first stay at this wonderful rental! 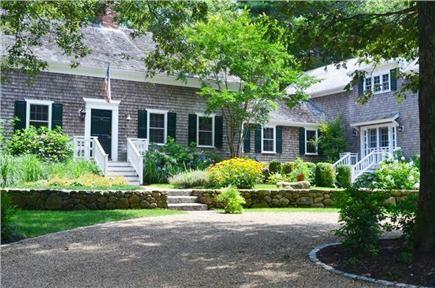 The well manicured property and home is conveniently located near Lambert’s Cove Beach, and an easy jaunt into Vineyard Haven. Your home is so beautifully designed, furnished and equipped that we all were in awe of the attention you've paid to the comfort and enjoyment of your guests. There were 8 of us who spent the week and there was more than enough options for us to gather together for meals and for evening games and conversation or to find some private spaces for alone time. Each room is beautifully furnished and you have an amazing collection of original art to add interest. 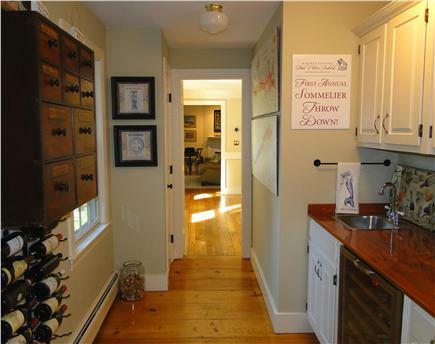 The kitchen is truly the heart of the home with ample room for everyone to participate in meal preparation and cleanup. The 2 dishwashers are a nice touch. We spent many enjoyable hours around the kitchen banquette surrounded by windows, watching the birds flock to the feeders in the morning. It was a favorite feature for everyone. 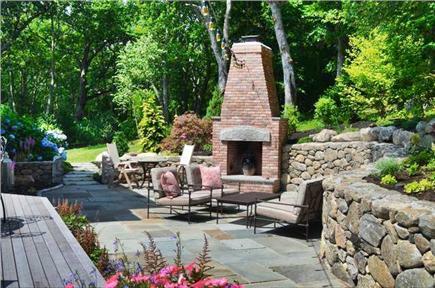 The grounds and back patio are meticulously kept and a great place to spend time outdoors. We made good use of the passes to the private Lambert's Cove Beach, which is so clean and peaceful. We spent a week in this wonderful home this past summer. We were with our children and grandchildren (ages 3 -7). There was plenty of space for all of us (10 people in all) and we never felt "on top of each other." The children had a fantastic time in the garden, and we enjoyed the back patio immensely. The landscaping is stunning and the fully equipped gourmet kitchen was a pleasure to be in. We loved the privacy of the magnificent and comfortable master suite after a fun filled day. The house is conveniently located to all the places one would want to visit on the island. The house has lovely artwork, which we enjoyed and found very interesting. The owner was very responsive before and during our stay to any questions we might have had. 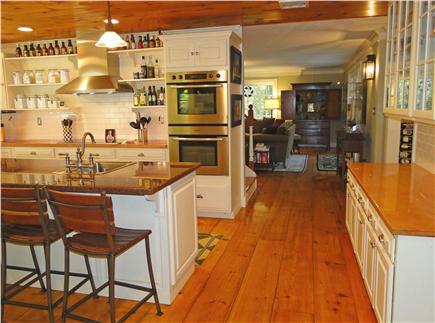 This is an amazing home situated on a large lot of land that is beautifully landscaped. 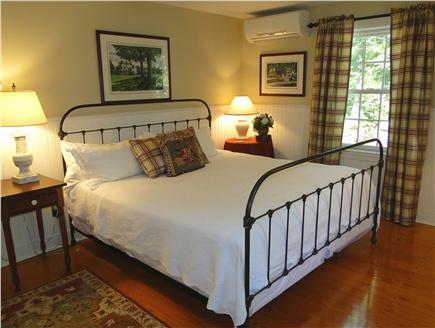 The home is lovingly furnished and equipped with everything you need for a wonderful vacation. 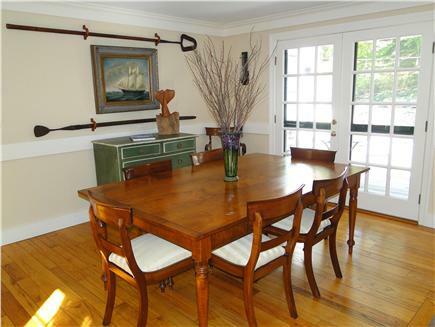 Unlike any other island rental, interesting art and antiques abound throughout the home! If you enjoy cooking, you will find a large, exquisite kitchen with everything you need, including 2 dishwashers and 2 ovens. Appliances are high end! There is a cozy breakfast nook overlooking multiple bird feeders. During down time, we enjoyed sitting here with the binoculars and island bird book identifying various species and learning about bird behavior. There are five bedrooms and multiple bathrooms with separately controlled air conditioning for those hot and humid days and nights. The backyard is wonderful at night with comfortable furniture, a hammock, a large barbecue and uplighting into the trees - a very special place to relax with family and friends at the end of the day. 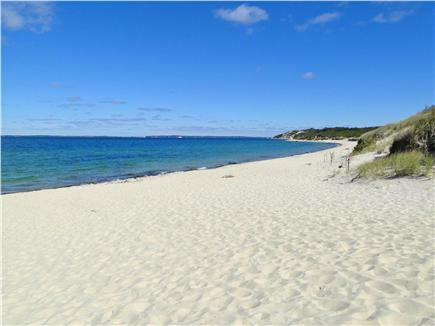 Situated close to Lambert's Cove, this home is centrally located not far from Vineyard Haven. Access to Trustees beaches is also available. The Monday turnover date is an added bonus making ferry reservations much easier to obtain than on weekends. We always get our preferred time. We plan on returning every year and look forward to this very special place and the wonderful owners. From the moment we turned down your inviting driveway, we were met with an overwhelming sense of peace and comfort as we approached the postcard-perfect view of your magnificent home. Welcoming, charming and relaxing are the words that best describe our week-long stay. Immaculately clean, yet every room had a unique personality that was easy to embrace. From a practical perspective, you thought of every detail. 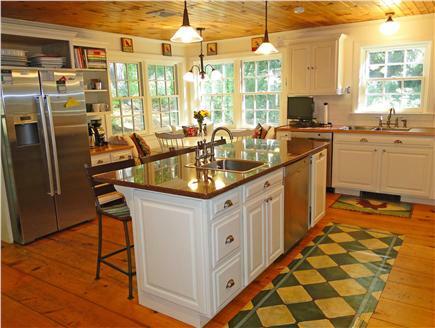 This is the first vacation home where the appliances were of premier quality and worked very well. In the end, it made life very easy. Location, location, location. Your home was a perfect jump-off point to enjoy the entire island. Easy access to local eateries (I'm addicted to the Limpopos from State Road Restaurant), a quick walk to Lamberts Cove Beach (what a gem), a simple drive to Edgartown or take-in a local fair. It was never a hassle. The worst part of our trip was packing-up and leaving. Will we be back? Absolutely! Thank you for sharing your home with us and we look forward to our next adventure in paradise.